This page shows some of the special requests we have implemented for various cloth colours, timber stains and styles. Here we see a custom design which is also quite modern. This shallow framed table has been finished with Victoria cushions and square tapered legs. 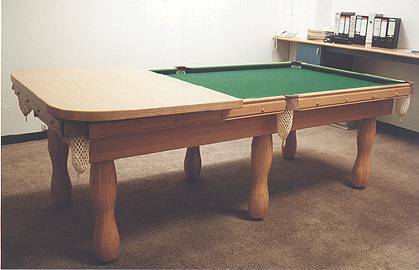 With the beech timber colour, grey cloth and chrome fittings (brackets and feet), this table is far from traditional. 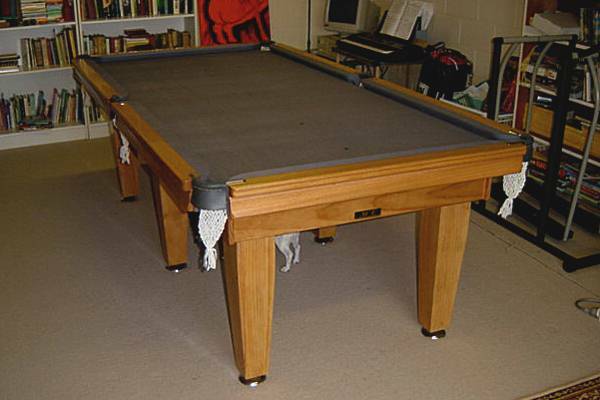 Here we see the Monash finished in a walnut timber stain and moss blue cloth. 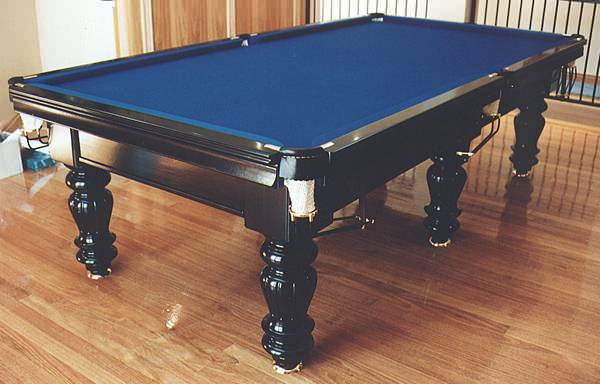 This photo is of a Victoria Model with a black timber stain and blue cloth. 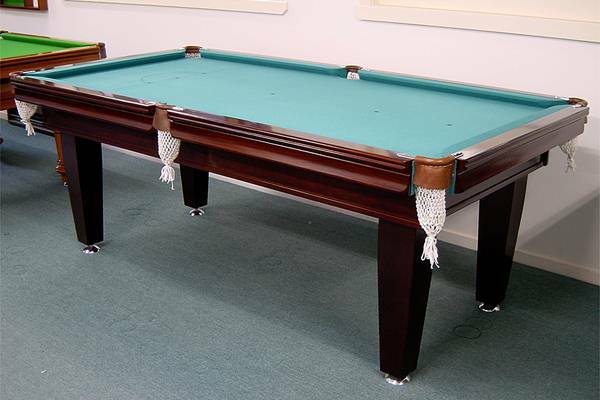 Finished off with an eight inch 'Special' leg and Empire Rails on the pockets, this table makes quite an impact. Shown here is The Victoria model with a unique leg style designed for the client's modern 'art gallery' style extension. Finished in a beech timber colour, this table makes quite an impression on the polished floorboards. Pictured right is a special design based on a Premier model. Finished in a beech colour with traditional green cloth, this office chose a 'peanut' shaped leg and a three leaf table top. (This photograph shows one of the three sections in place). On the left is a Victoria model with a cylindrical leg design. 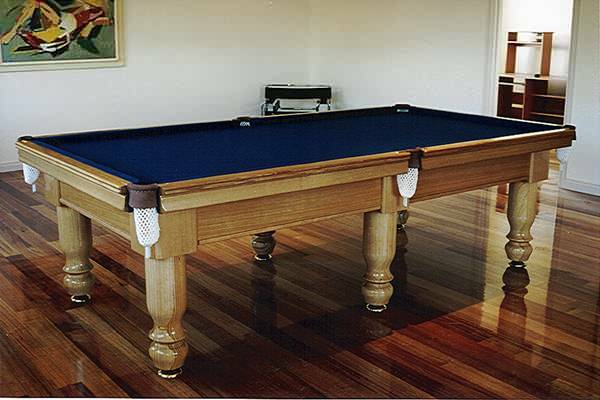 The timber has been finished in a swamp gum effect with moss blue cloth, creating a modern, natural appearance. 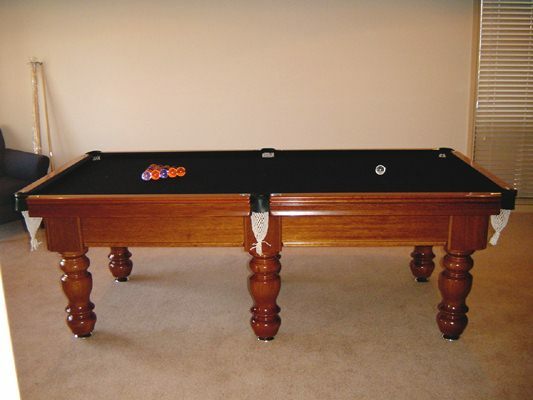 Although this Victoria is a rather standard model, it makes our custom section for having a black cloth. 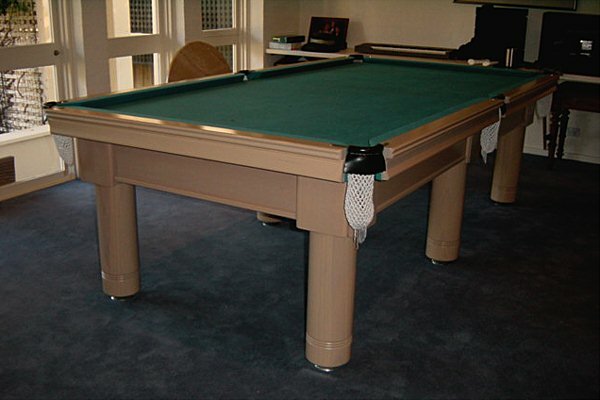 Rarely seen, the black cloth is an eye opener, especially when the 'crystal' pool balls are used.